Completed the Beginner 1 course at Italia 500 or at least 20 hours of formal tuition elsewhere and you lead a busy life? Our ​standard Italian Beginner 2 course - consisting of one 2.5 hour class per week, for a total of 8 weeks (20 hours tuition) and corresponding to level A1.2 of the Common European Framework of Reference for Languages - is the course for you. One 2.5 hour class per week for a total of 8 weeks. Pick whichever day below suits you best but please choose carefully as, due to classroom size, it is not possible to switch between days during the course. (6.15pm - 8.45pm) - No spots left. Each class includes a short break. *Please note: due to the Easter and Anzac Day holidays, neither the Tuesday nor the Thursday class will be held on the 23rd and 25th of April, thus lesson 4 will be postponed to the following week. Grazie! Please note: at the moment we will be accepting enrolments for the Beginner 2 courses only by current and former Italia 500 Beginner 1 students. If you have completed approx. 20 hours of formal tuition elsewhere and would like to join the course, do contact us and, if there are spots available, we will let you know. The early bird rate at the time of your enquiry will apply. There is no need to purchase expensive textbooks. In fact the prices above include, at no extra cost, the Italia 500 Beginner 2 course notes, in Pdf format, & the Italia 500 Beginner 2 Practice Cds, in Mp3 format, which accompany the course, available for download on enrolment, &, of course, GST. Italia 500 does not charge an enrolment or membership fee. Enrol securely online by debit or credit card, regardless whether you have a Paypal account or not. Click on the box above. By enrolling in our courses you agree to our Terms & Conditions of enrolment so please take a moment to read these prior to enrolling. ​contact us prior to enrolling. Our Italian classes are held at Italia 500 which is located in King York House, at suite 304, level 3, 32 York Street Street in Sydney's CBD, between Market and King streets, opposite The Grace Hotel, and between Wynyard & Town Hall stations (View our location on Google Maps). Buses and metered parking (from 6pm) are all within short distance. If you are driving in, it is probably more convenient to park in a parking station. To find which is the cheapest parking station nearby, please click on this link: www.parkopedia.mobi, insert in the "Where are you going?" field, "32 York Street, Sydney", and the appropriate time range. Our office hours are generally 1.30pm to 6.00pm, Monday to Thursday, however, if you are planning to drop by, please contact us ahead. Our small class size (average of 12 students) allows for plenty of practice and allows you to meet a range of truly interesting people whose contagious enthusiasm turns each Italian lesson into a gathering of friends rather than a formal Italian class. Italia 500 is like a microcosm of Italy. Alessi, Botticelli, Caravaggio, Marcello Mastroianni, Federico Fellini, Sophia Loren, Roberto Benigni, Emanuele Luzzati, etc., cinema, music, art, design combine to create a bright, richly Italian environment that inspires & infuses the students, & the teachers too. "For entertaining, expert and affordable Italian lessons right in the heart of Sydney, visit www.italia500.com.au and take your passport with you, for the minute you set foot in Italia 500 you'll swear you've travelled to Italy! Buon viaggio!" In the Beginner 2 course - and please don’t let the grammatical terminology put you off - we continue to work on the presente indicativo by talking about our travel plans, we study il passato prossimo in detail and we touch upon the imperfetto by describing how we spent the our time in Firenze. We learn how to invite someone out and decide where and when to meet, how to order in a restaurant, how to ask for information regarding public transport and we learn how to ask for and understand opening and closing times for museums and shops. 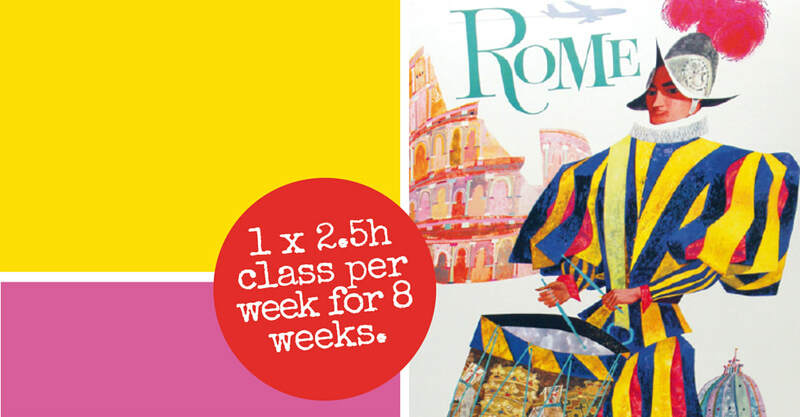 Learn about our approach to teaching Italian. Aiming for fluency in Italian? Our Italian courses are ideal for those aiming to achieve a high degree of fluency in Italian. In our Beginner courses (Beginner 1, 2 & 3) we start to build up our Italian vocabulary, to master the pronunciation, to learn how to construct sentences, to develop conversational skills so that you can actually hold a conversation relating to both practical topics and conversational topics, and to gain an understanding of how the language works - i.e. the grammar which we explain in the simplest and clearest of manners. Even only a basic knowledge of Italian makes such a difference when visiting Italy. We assume that the vast majority of our students will be travelling to Italy, either for the first time or will be returning to Italy in the future, so our beginner courses cover also a wide range of topics ideal for travellers and you'll find them extremely useful in providing you with the basic Italian and the travel tips that will truly enhance your visit to Italy. If you have studied Italian before yet you are wondering whether you should join the Italia 500 Beginner 2 course, or start from scratch, or join a higher level course, please contact us prior to enrolling. If you studied Italian in year 12 or at university as an undergraduate, no matter how long ago it was, please bear in mind that the Beginner 2 course is not a "refresher" course: it assumes that you completed 20 hours of formal Italian tuition. If you completed an Italia 500 Beginner 1 course or a beginner course elsewhere but it was quite a while ago, again, please contact us prior to enrolling. 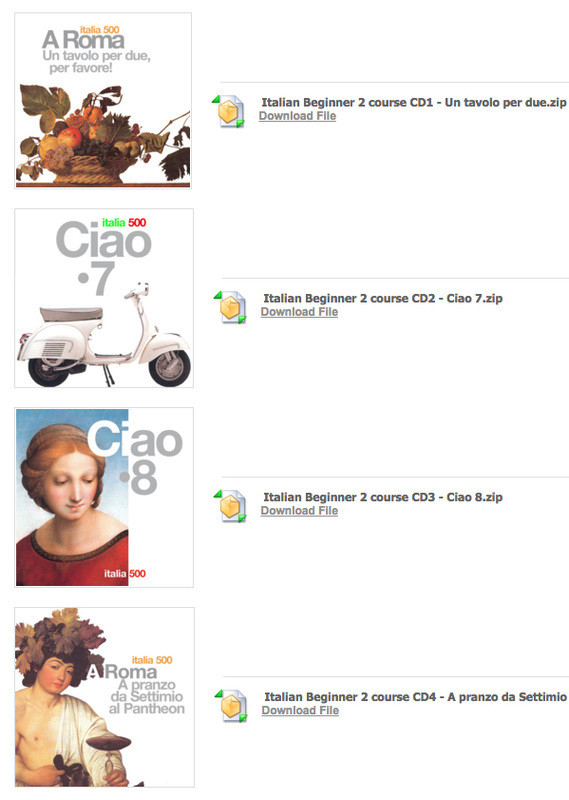 Our Italian Practice CDs, available in Mp3 format, have proven to be very popular with our students. They allow you to practise the vocabulary, the expressions and phrases, and the dialogue covered in your Italian class by repeating it several times, each time leaving a gap so that you can repeat it yourself. One of the most appealing features of the Practice CDs is that you can download them to your phone and listen to them in your car, at the gym, whilst you catch public transport or take the dog for a walk, and they represent a continuation of the class outside of class. They are also very useful if you happen to miss a class. If you would like to increase your learning rate and attend twice a week, you can enrol in a Beginner 3 course and attend both the Beginner 2 and Beginner 3 courses in the same week. Please contact us for availability and further information.